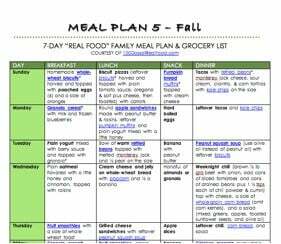 Home » Blog » Free Fall “Real Food” Meal Plan! “Real Food” Meal Plan #5 is finally finished! This particular meal plan utilizes fall produce that’s available at some farmers’ markets this time of year and is available to email subscribers only (see instructions below). These meals plans are incredibly detailed so I’ve only been able to crank out a new one every few months or so. But if you’re looking for some inspiration on a more regular basis then be sure to check out our sponsor, The Fresh 20. They offer new dinner meal plans weekly including vegetarian and gluten-free options! Become an email subscriber by entering your email address in the box above (if you are already a subscriber, just fill out the form again…you won’t be double subscribed). You’ll get instant access. Download or print and enjoy! As a subscriber, you’ll get weekly blog updates, too! Thank you! My husband was just beginning to despair that I would never have a menu plan for us again. This is PERFECT. I’m headed to Earth Fare tomorrow. SO EXCITED! Thank you for the meal plans, and for your terrific website. I started following the website when you did the first 100 days challenge. I took the “October Unprocessed” challenge and it really changed the way I think about food and what I am feeding my family. Now I am trying to continue to eat real food while not spending all of our time and money at the store! Your site is a big help! This is great! I only function on meal plans. The few times I skip a plan, I always wind up feeding my family quick and easy foods which are usually not “real” or healthy. Meal plans also save so much money! I have looked all over this page and can’t find the place to download the new fall meal plan. I tried clicking on the little photo part of it and that didn’t work. Where am I not looking? 1. If youâ€™re already a confirmed subscriber (all new subscriptions have to be confirmed via email before they become active) check your email because the full meal plan link is at the very top of the teaser email for this post. If you thought you were a subscriber, but you didnâ€™t get this post via email then you may have not confirmed your subscription. If you enter your email address again below youâ€™ll get another verification email, which will also contain meal plan link at the very bottom. 2. If you arenâ€™t a subscriber then enter your email address in the subscription box below and the meal plan link will be at the bottom of your subscription verification email where youâ€™ll also be asked to activate your subscription. Be sure to check your spam box if you donâ€™t see it right away, and once you get the email donâ€™t forget to click on the link in order to confirm your subscription! Thank you for the meal plan! I’m excited to try something different at home. Can’t wait to grocery shop this week! How about some ideas on what to bring to office pot lucks? I have a Christmas pot luck next week and I have no idea what to bring. I really want to bring something warm and yummy (it’s a lunch pot luck) but I can’t think of anything…any ideas???? This looks awesome! THANK YOU!!! Cant Wait to get started!! Thanks for sharing this. I’m going to see what I can do as we are a family of 5 and I have $130 budgeted to spend per week (it used to be that I could always do $100 but prices have gone up in the last 3 or 4 months). Perhaps I can find some coupons and sales. It’s so much easier when the menu is already created and I just have to follow the plan. You could definitely cut the cost down on this plan (using coupons and sales prices) and also going with a plain cream sauce instead of a marsala cream sauce and also a vegetarian chili instead of using beef. Good luck! I am a subscriber and didn’t get the email, re-subscribed and still can’t figure out how to get the meal plan. Please help. No worries…I will email it to those who are having trouble with technology! oops, nevermind, I found it. Erin, the link is in the confirmation email when you re-subscribe. This has nothing to do with this post, but I had to write and tell you what happened because I thought it would make you laugh. So I was craving chocolate today and trying to be good so I made the torte balls for the first time. My husband just came in the office and says “so why are there poop balls in the fridge?” I laughed till I had tears. oh my goodness… I hope he wasn’t serious (about you actually doing something that like!!) too funny! Thank you so much! I JUST started a Whole Food/Organic life change with the entire house. I have been searching for something like this & what do ya know, I stumbled on it from Pinterest! Thank you! I have tried several different online meal plans, but I’m loving yours because it incooperates breakfast & lunch. I have my husband on board to try everything with me. Thanks from the bottom of my heart for providing such wonderful tools. I’ve been eating whole foods, and have eliminated soda altogether so far this year. I have had SOOO much more energy to chase my 1 1/2 year old around. May the Lord bless you a hundred fold for being so giving! I am starting the week five meal plan tomorrow. I am very excited but had two random questions. #1 Do you think I could make the biscuits on my pizza stone as we just moved and I have no idea where my baking sheets are. #2 How do you store your muffins after they cool? Mine always tend to get either a.damp or b.super hard. Any insight would be very helpful! Also I wanted to say, Thanks so much for your website. You truly are an inspiration and I appreciate all the time you take to make such a terrific site. Lisa, what about a winter meal plan? I’m dying here, our farmers market doesn’t start back up til May! The END of May! For now, my sister and I have been doing a monthly trip to Whole Foods (2 hours away!) just on our own to get the ball rolling, but I’m really ready to go all in. My daughter and I have GI problems and I’m betting this will help. Thank you for all you do! No winter meal plan yet…and I know I am counting down to summer crops as well! How do I access the fall meal plan if I subscribed after this was originally posted? I am a subscriber now but don’t have the email with the link. Hmm…I resubscribed and got an immediate response that I was already a subscriber, but haven’t gotten anything through my email yet. I don’t know if it takes time or if I am doing something wrong? I subscribed and never recieved the 5th meal plan…can you help me out? I never received the 5th meal plan either. I subscribed and received the link, but it doesn’t work. I tried using it through the email, I’ve even tried pasting the link into a new “temp” web page I created, in case it would only work that way. But it doesn’t work no matter what I do. Thanks! Hi, first off, thank you so much for your wonderful web site. It has helped make the switch to “No Processed Foods” so much easier for my family. I would love the 5th meal plan, but I keep getting this message “FeedBurner has not been enabled by the administrator of the domain @cavtel.net.” when I try to subscribe. Frustrating because I have used the other meal plans several times over and my family is aching for some new recipes. Thanks again for all you do. I would like to know the recipes here are made for how many servings? What a wonderful site. I’m working to transition my family of 3 to “real food” … so this site is wonderful. I must say however, that prices in Canada are FAR higher. The per item cost is significantly higher on some items and combine that with a 13% food tax – it’s a bit discouraging to see the difference in cost! Keep up the great work – the pre planned food menu is key for me! These are a huge help. Hello, I love this site and have printed out the meal plan, my question though is I know the meal plan is for a family of 4 and I am only going to be cooking for 1 (or possibly 2 if my fiancÃ© joins in) How can I scale down the recipe’s? or can I freeze them and then reheat them the following week? Thanks! Lately he (really we) have been guilty of ordering out for lunch (…and sometimes dinner) and we want to have a lunch option that is kinder to our bodies and pockets. All the lunch ideas are wonderful for kids, but i’m not sure if it would work for adults (especially men…). Has Lisa or anyone else written about lunch ideas for working adults? Thanks!! I am a subscriber but don’t have this email, re-subscribed and still canâ€™t figure out how to get this meal plan. Can you help me, please? Thanks! Found it !!! So happy now!!! Love your site! Hi! I would love to see updated prices on the meal plans. The ones on the blog are from 2011 and it is now 2014. According to the prices at my local natural foods store and Greenwise section at the local Publix, they are too low. I figure that I can not match the plans for less than $200 a week now and that is just for the food. Hi, I am already en email subscriber and cannot find my email with any meal plans. Is there a way to get this one and the ones that are included in the welcome letter again? I’ve searched all through my emails. Thanks! Hi there. I’ll send it to your email.